Martha Berry thanks Mr. Holt for the gifts he has sent. He also sent some books of poetry by Grace Nell Crowell. Martha Berry is not feeling well and wants to go help the students. She also wants Mr. Holt and his wife to visit the campus. 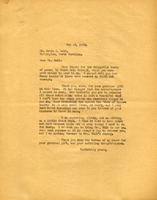 In this letter Erwin A. Holt updates Martha Berry briefly on his personal life and confirms that he and his wife will be present when Martha Berry receives her degree at Chapel Hill.